My grandpa is probably thinking to himself right now, "another coleslaw recipe?" You see, I apparently once told him that I don't like coleslaw, and yet recipes with cabbage keep popping up on the blog! I suppose I need to clarify my previous statement. I like coleslaw, so long as it's not the typical mayo-soaked cole slaw you find at your local bbq joint. However, I'm all about coleslaw dressed in something other than mayo, such as this version, which is mixed with a Greek yogurt dressing. As Rebecca mentioned when she posted the original recipe, this coleslaw gets better as time passes. It made a pretty large batch, but we had no problem finishing it off. My Aunt Becky and Ryan, two self-proclaimed coleslaw haters, both loved this version as well. I loved the sweet cranberries, the crunchy almonds, and the vinegary dressing. Have you tried using Greek yogurt in recipes yet? What an awesome substitute for sour cream and mayo! 1. In a small bowl, combine yogurt, honey, lemon juice/vinegar, salt, pepper, and celery seed. Set aside. 2. 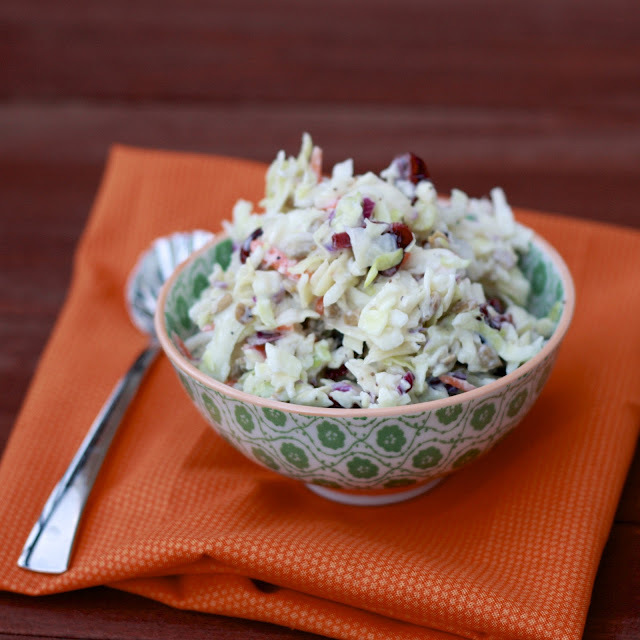 In a large mixing bowl, toss coleslaw with 1/4 cup cranberries and 2 tbsp seeds or almonds. Mix in dressing and toss until coleslaw is coated. Transfer to a serving dish and top with remaining cranberries and seeds/almonds. Refrigerate until serving (and refrigerate leftovers, covered, up to four days).